I have lots of greens in my collection, and this one wasn't at the top of my list when I was thinking about a design to paint. But it just so happened that they day I was due to paint my green nails my stamping plate order from My Online Shop arrived. One of the plates I got was MJ XXV, and it has a range of full nail designs as well as some single images that are perfect for advanced stamping or decals. 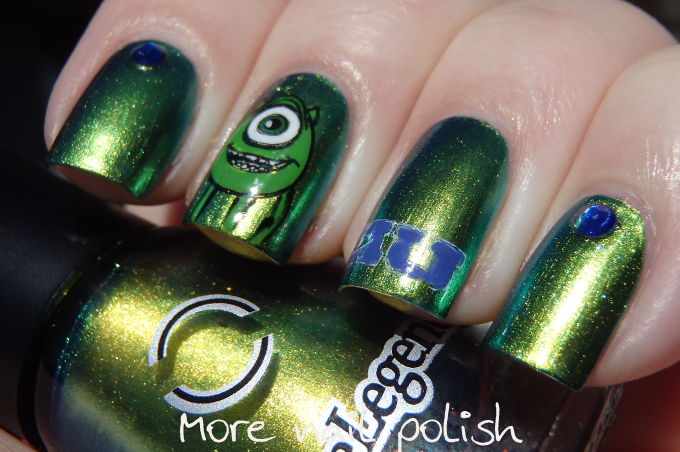 When I spotted the little Mike Wazowski image, I knew what I was going to paint for the green prompt, and I knew exactly which polish would be my green base - Dance Legend Wazowski. I created the little green monster with the advanced stamping technique, the only thing is that the stamp doesn't have any arms or legs. Luckily, Waz doesn't have very difficult limbs to paint, so it was easy to add them in later. 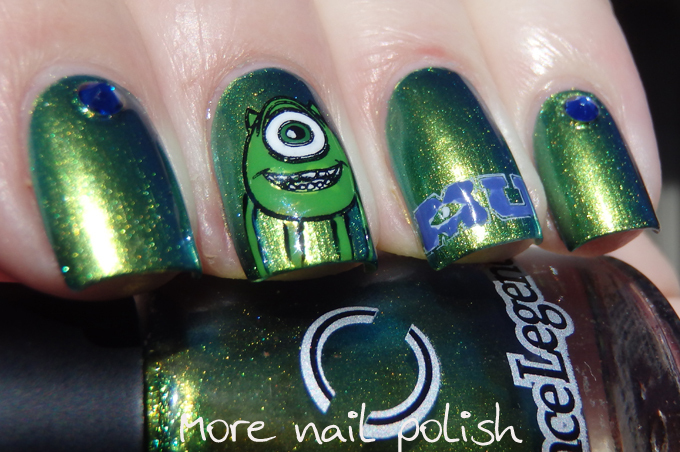 I also added some stamping with the MU logo on my ring finger, and my thumb had the full Monsters University logo on it. To pull the final design together as a proper mani, I added some royal blue Swarovski crystals, which pulled in both the blue logo and the blue duochrome finish to the polish. I also recently received some gorgeous midi rings from London based jeweler Astrid & Miyu.The ring you see above is the infinity ring in rose gold and I just love how delicate it is. I have two more rings to show you, but you can expect to see these showing in my pictures quite often, as I'm a girl that loves her bling, and these midi rings are the perfect accent to fancy nails! 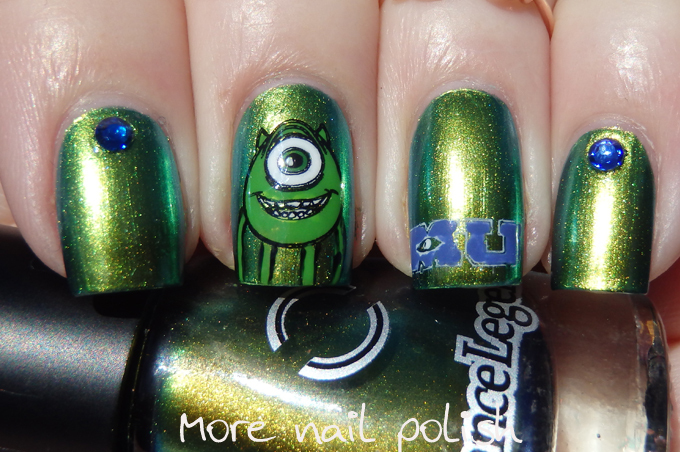 My green nails from 2013! 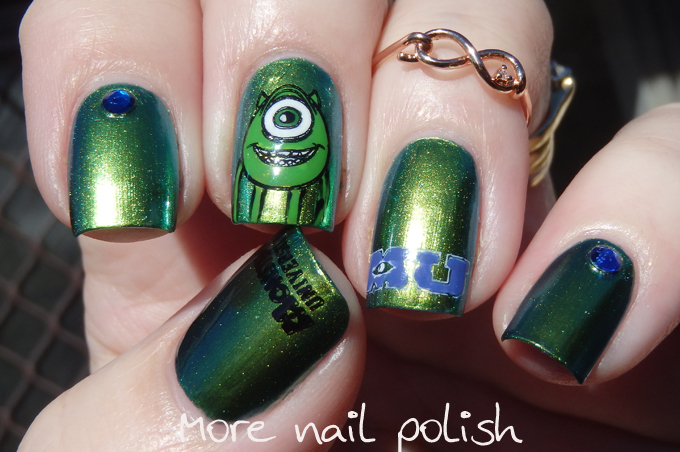 What a perfect match for the nail polish name and the stamping image! They look fantastic. After seeing the 31 Day challenge on your blog I've decided to have a go - I don't know if I'll be able to do a new manicure every day (I'm seriously impressed by how often you do your nails! ), but I'm going to attempt it. Oh, how I wish I could wear those rings. My allergy to nickel made me change all my rings and bracelets and it's quite annoying to find something fancy like that which won't trigger my allergy. Awe that is so adorable. And that Dance Legens base color looks amazing, too. Not gonna lie, I made a high pitched squeak when I saw these- spotted them on IG before here.